Albert Whitman & Company, 9780807573129, 32pp. Jonah loves Shabbat. But this week, as he helps his family set the table for dinner, something unexpected happens: he gets the hiccups! 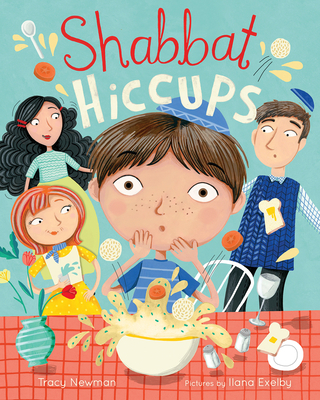 His sister, grandma, mom, cousin, and dad all suggest remedies, but no matter what Jonah does—eat sugar, hold his breath, have someone shout, “Boo!”—those hiccups simply won’t go away. Will his uncontrollable hiccups disrupt the festivities? Tracy Newman is the author of several children's books, including Uncle Eli's Wedding. Her writing inspiration comes from her daily adventures raising her children. She lives with her family and two cats in coastal New England. Working primarily in gouache, Ilana Exelby's illustrations are fun and bright with quirky characters and scenarios that people of all ages can relate to. Ilana has a degree in illustration from the University of Lincoln and is from the UK.